I will begin this review with one word that you have to keep in the back of your mind throughout this article - "different". I've driven almost all Toyota Corolla's that were released in South Africa, and they all followed the same distinct formula that seemed to work over the years, reliable, affordable, comfortable and some would say boring, that is if you exclude the RXi, RSi and Twincam versions of course. Amazingly what you paid for, in comparison to the competition, you fell short on features. This, however, didn't stop South Africa from supporting the Corolla badge, because at the end of the day you still had a damn good resale value. In the latest version of the Corolla, Toyota has changed it's tune a bit when it comes to features. Right from the starting line with the 1.3 Esteem you get all comfort features, minus a few high end technology bits found in the Prestige versions. We were setup with a 1.6 Toyota Corolla Prestige by Rishi from CMH Toyota in Umhlanga. From the moment that you lay your eyes on this car you know that it is different from all the other Corolla's that have come and gone. Styling is bold and new, with a hint of "I mean business" attitude built in there somewhere, yet it still has that prim and proper stance about it. The Prestige comes standard with colour coded bumpers and mirrors, and 16" alloys, but lacks a front fogs, making it just short of being complete. Inside it literally feels like opening up a Christmas present. You expect to see similar trends that Toyota has been following for years but you are met with an unexpected surprise. The interior has broken away completely from tradition and gone off on an adventure somewhere. Bringing back with it a sleek and sophisticated design that's packed with technology. A totally revised dash board combines high gloss finishes with chrome trimmings and a sophisticated but simple layout that's easy for you to navigate through. The highlight of the centre console is a 6.1 inch touch screen media centre that is bluetooth and usb compatible which is coupled to a six speaker sound system. Vehicle stats are still isolated to the instrument cluster. But the main attraction about that 6.1" LCD is it also doubles as screen for a reverse camera. Leather is standard and the white stitching makes the Prestige all that more prestigious. On the safety side there are driver and passenger front and side torso airbags. As expected take off isn't too exciting, you run through the six speed gearbox on the highway and you feel nothing, just plain and simple driving, but you literally feel nothing, if you could apply the saying to this situation I would say that the ride is as smooth as a babies bottom. But during my discussion with Rishi along the highway I never thought to look down at the speedo, and I could not believe what speed I was doing. I slowed down and started accelerating again just to see if I missed anything during acceleration, and I couldn't believe it, you don't feel it but it's there on the speedo, 154nm of torque launching the car forward. 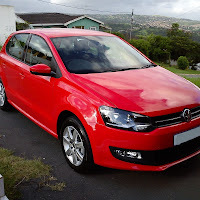 But this is what the 1.6 Prestige is all about, it's about the comfort and the enjoyment of the drive. The 1.6 litre power plant is claimed at doing 6.6l/100kms combined cycle. And now the price tag. 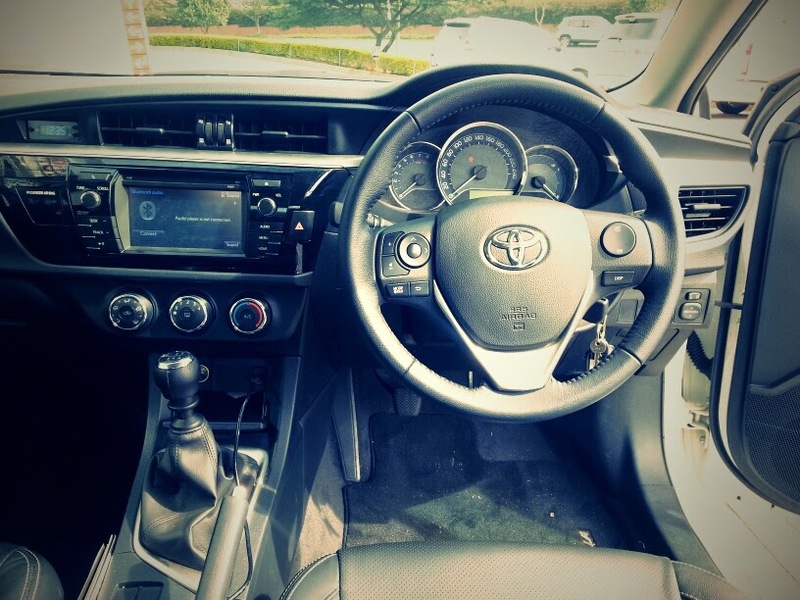 For R241 900-00 (2014) I think that Toyota have finally got their price to features ratio right. 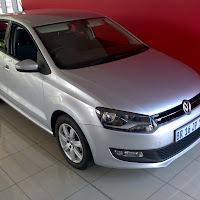 As was standard on it's predecessor you will get a 5yr/90000km service plan and 3yr/100000km warranty. 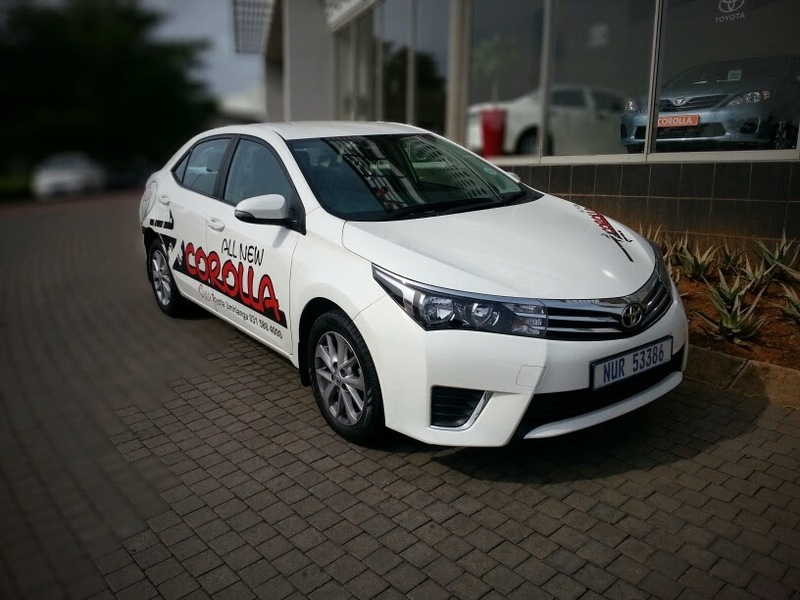 Just a note on the previous Corolla, Toyota SA has decided to continue this model as their budget sedan and rebranded it as the Corolla Quest, and I must say, for what you get at that price, it's value for money. expect to see similar trends that Toyota has been following for years but you are met with an unexpected surprise.